Posted by OromianEconomist in US-Africa Summit. Washington wants a stable partner in the Horn of Africa. But cozying up to the repressive regime in Addis Ababa isn’t the way to go about finding one. These are indeed laudable goals and should be actively pursued by the U.S. government. But the timing and tenor of the visit to Addis Ababa sends a worrying signal that Washington’s priorities — not only in Ethiopia, but on the entire continent — are actually at odds with the president’s oft-repeatedrhetoric about advancing human rights and strengthening African democracy and institutions. Let’s be clear: Ethiopia is not a model of democracy that should be rewarded with a presidential visit. Let’s be clear: Ethiopia is not a model of democracy that should be rewarded with a presidential visit. The long-ruling Ethiopian People’s Revolutionary Democratic Front (EPRDF), now in power for 25 years, claimed a landslide victory inlegislative polls held in May, winning all 547 parliamentary seats, which places it among the ranks of North Korea and Saddam Hussein’s Baathist Iraq in terms of the sheer efficiency of its electoral sweep. The results should not have come as a surprise: theEPRDF swept the last four elections, including in 2010,in which it took a whopping 99.6 percent of the vote. This time around, Washington and the European Union did not even bother sending election observers, knowing full well that anEPRDF victory was a foregone conclusion.The lead up to the May 24 vote saw a widespread crackdown on journalists, human rights activists, and opposition supporters. What’s worse, Obama’s trip was announced on June 19, the same week it was revealed that threeopposition party members were murdered in the country, all under highly suspicious circumstances. So why is President Obama visiting a country where democracy is in such a sorry state and where human rights violations remain systemic and widespread? 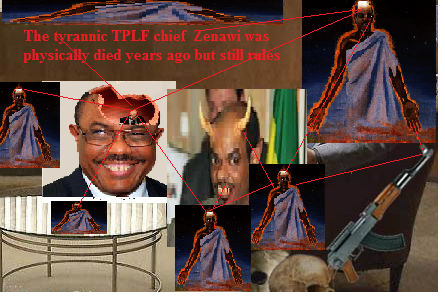 Because, despite the obvious lack of political rights and civil liberties in Ethiopia, and its status as one of the top jailers of journalists in the world, Prime Minister Hailemariam Desalegn is palatable to Washington and other Western donors precisely because of who he is not: a retrograde dictator in the mold of his regional counterparts, Isaias Afwerki of Eritrea or Omar al-Bashir of Sudan. 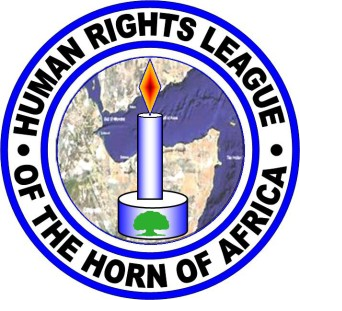 The brutal and oft heavy-handed oppression exhibited by the latter two regimes is brazen, whereas Desalegn and the EPRDF work within the (regime-controlled) judicial system, giving their repression a veneer of legality. A former academic, Desalegn’s elevation to the highest office in Ethiopia came courtesy of the sudden death in 2012 of Ethiopia’s strongman, Meles Zenawi, who had ruled the country for two decades. Zenawi was a favorite in Washington: Though he brutally crushed political opponents and implemented a series of draconian laws meant to muzzle the press and stifle dissent, he also managed to establish an image of Ethiopia as a stable and growing economy in the troubled Horn of Africa. Zenawi’s Western allies, particularly the United States, applauded the country’s modest economic growth and the regime’s willingness to endorse the so-called “War on Terror.” As a result, leaders in Washington routinely turned a blind eye to the EPRDF’s rampant human rights abuses and its ongoing suppression of civil society, the media, and political opposition. Several key Obama advisers were close associates and personal friends of the late prime minister. Susan Rice, Obama’s national security advisor and former top diplomat at the United Nations, for instance, made no secret of her esteem for and friendship with Zenawi, whom she eulogized as “a servant leader.” Another top Obama aide, Gayle Smith — the current nominee to lead the United States Agency for International Development (USAID), which provided Ethiopia nearly $500 million in 2013 — was also never shy about her admiration for Zenawi. Desalegn, largely seen as a compromise candidate for the shaky, ethnicity-based EPRDF coalition, has continued to rule in the same mode — and Washington’s perverse need to embrace a dictator in technocrat’s clothing has continued. 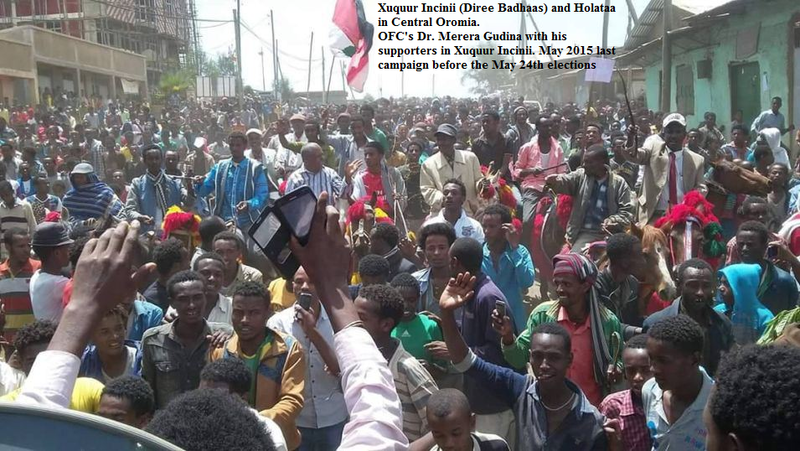 This March, two months before Ethiopia’s sham elections, U.S. Undersecretary for Political Affairs Wendy Sherman publicly praised Ethiopia’s “democracy” during a visit to the country, which a state department spokesperson further bolstered by saying “her statements fully reflect the U.S. Government’s positions.” Even a cursory glance at Ethiopia’s abysmal human rights record would turn this bogus claim on its head. On June 25, the State Department released its annual human rights reporton Ethiopia, citing widespread “restrictions on freedom of expression,” “politically motivated trials,” “harassment and intimidation of opposition members and journalists,” “alleged arbitrary killings and torture,” “limits on citizens’ ability to change their government,” and restrictions on freedom of assembly, association, and movement. Yet Ethiopia’s donors, including the United States, which provides nearly half of Ethiopia’s national budget, have continued to ignore these signs of trouble. The facade of economic growth and the West’s eagerness for a “development success story” to tout on the international stage has seemingly precluded genuine diplomatic pressure to reform. 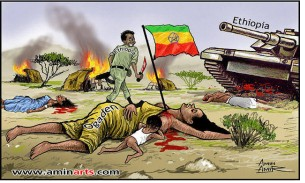 To be sure, deeply afflicted countries surround Ethiopia. Despite recent progress, Somalia faces credible and ongoing threats from the al-Qaeda affiliated militant group, al-Shabab. South Sudan has devolved into an intractable civil war with no end in sight. Kenya has yet to fully overcome the ramifications of post-election violence in 2007–2008, not to mention its inability to ward off al-Shabab’s cross border attacks. Eritrea, dubbed by some as the North Korea of Africa, remains a highly repressive police state from which hundreds of thousands continue to flee. Further afield, Yemen is in a state of bloody lawlessness. By contrast, Ethiopia has remained largely stable. Despite this outward veneer of stability and progress, Ethiopia’s current system is unsustainable. A one-time vocal opposition has been systematically weakened. Ethnic discontent is rife. Religious revival has been met with brutal state repression. Economic prosperity is not widely shared and inequality continues to rise. Nepotism and corruption plague an already bloated bureaucracy. Youth unemployment is a persistent and serious challenge. Independent media, the human rights community, and civil society writ large have been decimated. And countless citizens arebeing displaced from their ancestral lands under the guise of development. These factors, taken together, may ultimately sow the seeds of a tangled conflict that could reverberate across an already troubled and tense region. In this context, Obama’s upcoming visit to Ethiopia sends the wrong message on Washington’s stated commitment to strengthening democratic institutions — not strongmen — in Africa. What is more, turning a blind eye to widespread human rights abuses for the sake of counterterrorism cooperation and so-called “regional stability” may prove to be a self-defeating strategy that is bad in the long term for the United States, as well as for citizens throughout the Horn of Africa. If the United States wanted to help strengthen democratic institutions and stand in solidarity with Africans, who are now more than ever demanding democracy, then Nigeria would have been a much better alternative model. Nigeria, Africa’s most populous nation and its largest economy, held landmark elections this March, in which an opposition candidate ousted an incumbent who then graciously accepted defeat. In Ethiopia, this scenario remains a pipe dream for its 96 million citizens. The EPRDF is now set to lord over the country at least until 2020, allowing the party to further entrench its repressive machinery and to extend its dominance long beyond its current mandate. It is unlikely that Obama and his handlers will change the itinerary of his upcoming trip. However, it is not too late for the president, and for the United States government, to speak honestly to the people of Ethiopia, making it clear that the historic visit is not intended to validate or otherwise endorse the EPRDF’s autocratic dominance. Rather, Obama should be clear with EPRDF leadership, both in private and most importantly, in public that the United States appreciates the complex challenges facing the country and that repression is not an acceptable means of addressing them. Obama and his staff should also meet openly with Ethiopia’s political opposition and civic leaders, including those based in the country and abroad in Kenya, where many have been forced to relocate due to increasing oppression at home. Obama should additionally raise the issue of the recently murdered opposition members, as well as the many cases of journalists, activists, and political prisoners who have been wrongly jailed and arbitrarily detained under a raft of draconian laws that have criminalized dissent. In the long-term, the U.S. government should redouble its commitment to Ethiopia’s beleaguered civil society. Obama’s 2016 budget request includes more than $400 million in assistance to the country, of which less than 1 percent is allocated for democracy and human rights programming — an actual improvement from last year, when zero was devoted to this vital sector, much of the spending going towards health and humanitarian aid. A robust, reenergized, and empowered Ethiopian civil society, in which human rights groups are free to operate, is central to deepening democratic principles, not only in Ethiopia, but also throughout the East and Horn of Africa. Overall, Obama must firmly reiterate that stability and security, and respect for basic human rights and the legitimacy of civil society, are not mutually exclusive objectives in Ethiopia, or elsewhere. Rather, he should be unequivocal — in both rhetoric and in practice — that, together, these issues help form an unshakable and long-term pillar for U.S. engagement on the African continent. 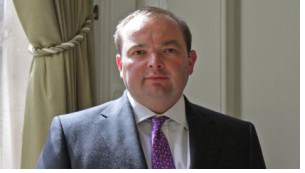 The Ambassador made the remark during an interview with the English-weekly The Reporter. The interview, published in the weekend, was conducted days before the officially announcement of final election results last Friday. Nonetheless, a total win by the ruling party EPRDF and its allies was widely expected since the last week of May. The Ambassador’s remark came at about the same time British Foreign Minister issued a strong statement regarding Andargachew Tsige‘s case. Western diplomats in Addis Ababa, unlike elsewhere, seldom remark on domestic politics, especially since the 2005 post-election crisis that impacted relations with a couple of diplomatic missions. Question: What is your take on the recent election in which the ruling party won all the 547 seats in parliament? Would you characterize it as free, fair and credible? Posted by OromianEconomist in OFC, Sham elections. በ2007 በኢትዮጵያ የተካሄደውን ምርጫ በሚመለከት ከመድረክ የተሰጠ መግለጫ:- ሕገ-መንግሥታዊና ሕጋዊ የምርጫ ሥርዓት በተጣሰበት ሂደት የተከናወነው ሕገ ወጥ የምርጫ ድራማ ተቀባይነት ሊኖረው አይችልም! ሕገ-መንግሥታዊና ሕጋዊ የምርጫ ሥርዓት በተጣሰበት ሂደት የተከናወነው ሕገ ወጥ የምርጫ ድራማ ተቀባይነት ሊኖረው አይችልም! ሰኔ 19 ቀን 2007 ዓ.ም. 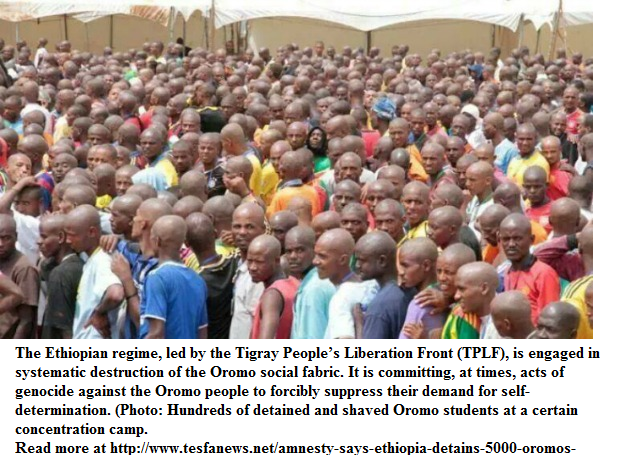 Posted by OromianEconomist in Amnesty International's Report: Because I Am Oromo, Ethiopia's Colonizing Structure and the Development Problems of People of Oromia, Afar, Ogaden, Sidama, Southern Ethiopia and the Omo Valley, Free development vs authoritarian model. Barack Obama’s decision to visit Ethiopia has shocked human rights activists, who say the visit sends the wrong message to a repressive government widely accused of clamping down on dissent. A White House statement said Obama will visit the east African country for meetings with government officials as part of his last African trip as president. As well as meeting the leadership of the African Union, the visit will form part of US efforts to strengthen economic growth, democratic institutions and improve security in the region. But as activists and social media users have been making clear, Ethiopia’s track record on human rights and democracy is deeply troubling. In its 2014 report, Human Rights Watch noted that Ethiopia increasingly clamps down on the freedoms of its citizens “using repressive laws to constrain civil society and independent media, and target individuals with politically motivated prosecutions”. Last month, Ethiopians voted in parliamentary elections which were widely denounced as unfair. Though the African Union declared that the vote was peaceful, they fell short of using the words “free and fair”. While the US state department has expressed concerns about restrictions on civil society, media, opposition parties, and independent voices, Ethiopia remains a significant recipient of foreign aid money and security support. Mootummaan Biyya Inglizii flannoo Itopiyaatti ta’e ilaalchisee yaaddoo akka qabu ibse. The 24 May election was worse than a sham. In turning the poll into a process of complete elimination of the opposition, the government and the ruling party have loudly told the Ethiopian people that any hope of change through peaceful means is just an illusion. 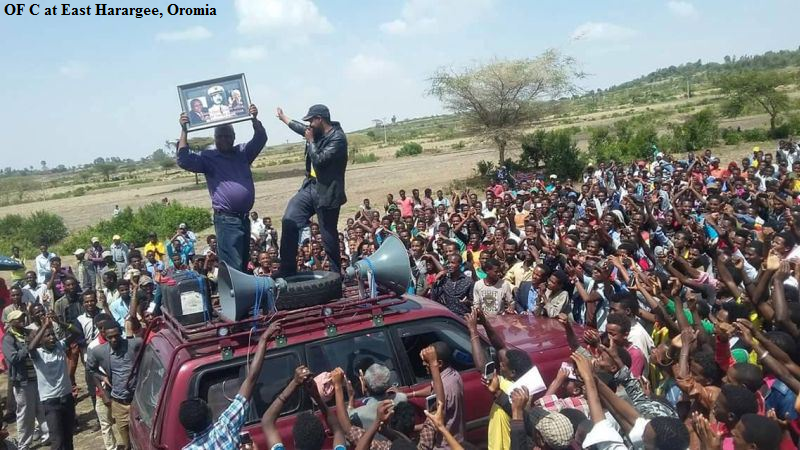 According to the National Election Board of Ethiopia, the result of last week’s national election is that the EPRDF (Ethiopian People’s Revolutionary Democratic Front) has achieved a complete victory by grabbing all the parliamentary seats. The same board and the Ethiopian government qualified the result as a triumph of democracy, which leads one to assume that in today’s Ethiopia the progress of democracy is measured by the size of exclusion of opposition parties from parliamentary participation. In 1995, the process resulted in 75 seats to various opposition parties; then it evolved to one representative in 2010; until it has reached the present stage of advanced democracy with zero representative from the opposition. Bravo to the EPRDF! Be it noted that this novel interpretation of democracy seems to be endorsed by the American government through the authoritative voice of Wendy Sherman, the Under Secretary for Political Affairs (go to http://www.diretube.com/ethiopia/under-secretary-of-state-wendy-sherman-talking-about-ethiopia-video_851c48f3b.html) The only step remaining to achieve the apex of democracy is the banning of opposition parties, obvious as it is that they have become obsolete. On a serious note, last week’s election appears very enigmatic to many observers. For one thing, in view of the creeping discontent in the country, which is even expressed outwardly here and there, in view also of the paranoia of the regime showing an unprecedented level of mobilization of its repressive forces to intimidate voters and stifle dissenting voices, a complete parliamentary victory strikes by its utter impossibility. There is only one possible conclusion: not only the election was not free and fair, but it was also subjected to fraudulent practices, such as stealing or eliminating votes supporting the opposition. The question that comes to mind is the following: if neither the people and opposition parties give an iota of credibility to the official result, nor for that matter the officials and the cadres of the ruling party themselves––since they used all repressive and fraudulent means to eliminate the opposition––in a word, if nobody lends any credibility to the official outcome, why is the ruling party going through such a costly, time-consuming, and utterly useless exercise? What is the expected gain? Can we say that the election serves the purpose of renewing legitimacy? But how can a government renew legitimacy by claiming an unbelievable victory? Who falls for a score of 100 percent? What about the international community? Perhaps, but again provided that you come up with something believable, and 100 percent is not believable. Accordingly, such a score defeats its purpose, if it is legitimacy. This is what is most perplexing: a lesser score (say, for example, of 80 percent) would have gained some credibility without, however, endangering the hegemony of the ruling party. Indeed, why not leave some seats to the opposition? So long as the ruling party retains an overwhelming majority, the opposition does not present any risk. What is more, the presence of the opposition, however negligible, would give some sense to the voting process in the parliament. 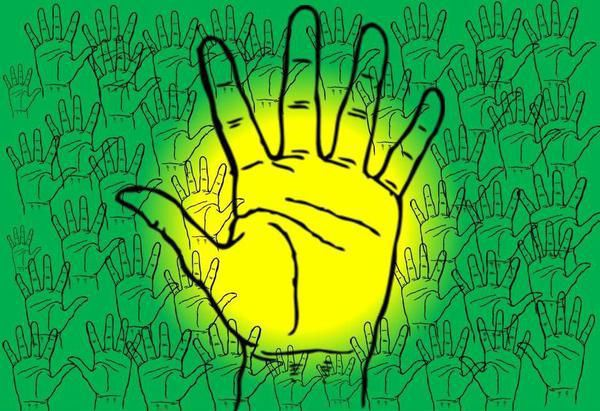 There is more: in turning the election into a process of elimination of the opposition by all means necessary, the government and the ruling party are loudly telling the Ethiopian people that any hope of change through peaceful means is just an illusion. This is none other than forcing the people to seek other means, namely, violent forms of struggle, such as uprisings and armed struggle. It is hard to understand why a government would push its own people to violent methods. If, instead of renewing legitimacy, a score of 100 percent only succeeds in cornering people to violent means, why on earth would a government adopt such a detrimental policy? We only saw negative sides. Where is the gain? The huge enigma here is that, unlike most dictatorial states, the regime in Ethiopia has recognized multiple opposition parties, even if it has restricted their activities to what it deems tolerable. While the general rule for dictatorial regimes is to ban opposition parties altogether, the Ethiopian regime recognizes them except that it does not want them in parliament. 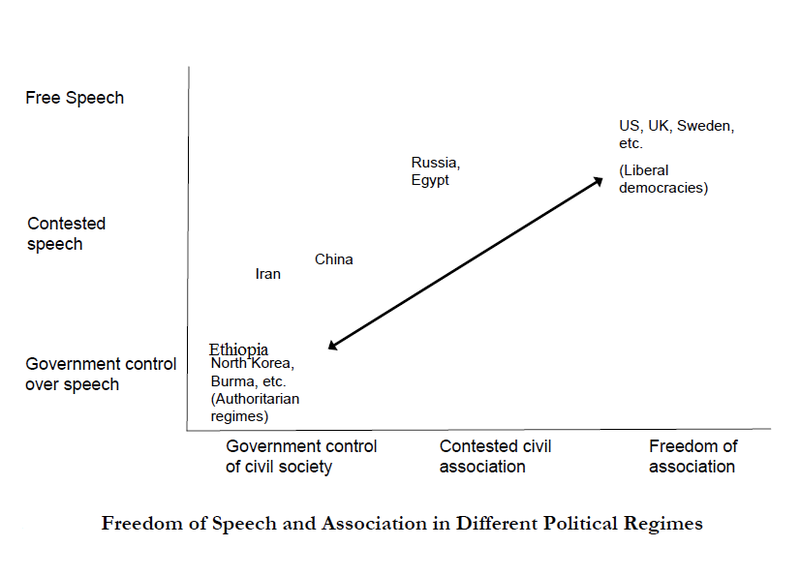 Since in both cases the result is the same, the behavior of the Ethiopian regime may become intelligible if we get hold of the reason why even dictatorial regimes that ban opposition parties organize elections. Where no opposition parties exist, the purpose of election cannot be the achievement of victory. As there is no contest, the claim of victory would be simply surreal. By contrast, single-party regimes are concerned with the number of people who come out to vote, the issue being to get out the maximum number of voters by all means necessary. Clearly, the objective is not to gain the majority of votes; rather, it is to demonstrate force. Elections are meant to show the extent of the control of the government and the ruling party over the people. The less the people like the regime, the higher is its need to show the maximum electoral score, thereby displaying its invincibility. The message is then clear enough: even if you do not like the regime, there is nothing you can do about it. As such, it is a celebration of defiance, a parade, a showoff of political force. It seems to me that the dominant party in the governmental coalition, the TPLF (Tigrayan People’s Liberation Front), has perfected the meaning of election under dictatorial rule: unlike one-party dictatorships, it recognizes opposition parties, allows them some freedom of maneuver, only to deprive them of even one seat in the parliament as a manifestation of its absolute hegemony. This is none other than an extreme form of political bullying, as in the case when a child donates his toy to another child and takes it back after some time as a way of showing his dominance by aggravating the frustration of the other child. The ultimate goal of this political bullying is, of course, the inculcation of submission through the sense of hopelessness. While in democratic countries, elections establish the legitimacy of states through the exercise of popular sovereignty, in dictatorial regimes, like that of the TPLF, they are periodical rituals displaying the submission of the people. To the extent that these elections raise and then dash hopes for change, they renew the sense of hopelessness of the people, and so deepen their resignation. * Messay Kebede is professor of philosophy at the University of Dayton, Ohio (USA). He previously taught philosophy at Addis Ababa University (Ethiopia). He is the author of five books: Meaning and Development (1994), Survival and Modernization—Ethiopia’s Enigmatic Present (1999), Africa’s Quest for a Philosophy of Decolonization (2004), Radicalism and Cultural Dislocation in Ethiopia, 1960-1974 (2008), and Ideology and Elite Conflicts: Autopsy of the Ethiopian Revolution (2011). He has also published numerous articles in professional and nonprofessional journals. 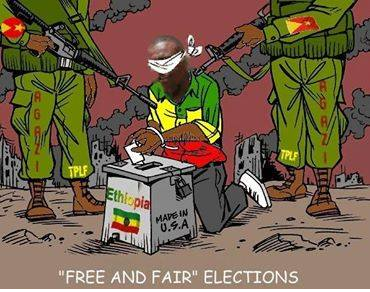 Posted by OromianEconomist in Africa, Sham elections. The United States commends the people of Ethiopia for their civic participation in generally peaceful parliamentary and regional elections on May 24. We acknowledge the National Electoral Board’s organizational efforts and the African Union’s role as the only international observer mission on the ground. We also note the importance of the nine televised party debates as progress in fostering open public discussion of the challenges facing the country. We encourage all candidates, political parties and their supporters to resolve any outstanding differences or concerns peacefully in accordance with Ethiopia’s constitution and laws. The United States remains deeply concerned by continued restrictions on civil society, media, opposition parties, and independent voices and views. We regret that U.S. diplomats were denied accreditation as election observers and prohibited from formally observing Ethiopia’s electoral process. 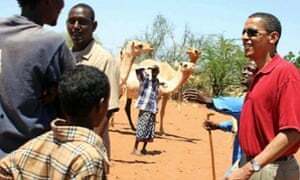 Apart from the election observation mission fielded by the African Union, there were no international observer missions on the ground in Ethiopia. We are also troubled that opposition party observers were reportedly prevented from observing the electoral process in some locations. A free and vibrant media, space for civil society organizations to work on democracy and human rights concerns, opposition parties able to operate without impediment, and a diversity of international and domestic election observers are essential components for free and fair elections. The imprisonment and intimidation of journalists, restrictions on NGO activities, interference with peaceful opposition party activities, and government actions to restrict political space in the lead-up to election day are inconsistent with these democratic processes and norms. The United States has a broad and strong partnership with Ethiopia and its people. We remain committed to working with the Ethiopian Government and its people to strengthen Ethiopia’s democratic institutions, improve press freedom, and promote a more open political environment consistent with Ethiopia’s international human rights obligations. Filannoo biyyoolessaa bara 2007 ilaalchisee dhaabbileen mirga namoomaa hedduun erga duula nafiladhaatii kaasee haalli jiru haqa qabeessaa fi bilisa akka hin taane mirkaneessaniiru. Wayyaaneen duula nufiladhaarratti tumaatii, dhaanicha, ajjeechaa fi hidhaa raawwachuun ni beekama. Dhaabbileen mormitootaa wal-falmii filannoorratti injifannoo guddaa galmeessisuudhaan deeggarsa ummata bal’aa argachuunis ni beekama. Rifaatuu kanarraa kan ka’een, mootummaan gabroomsaa kun filannoodhaaf guyyaan lama yoo hafu muummichi ministeeraa yeroo isaa malee paarlaamaa biyyattii walga’ii waamuuudhaan mormitootarratti doorsisaa fi dhaadannoo dhageessisanii turan. Kunis mootummaan bu’aa filannoo humnaan saamuuf qophii jabaa godhaa turuu isaa ni mirkaneessa. Dabballoonni ADWUI (EPRDF) ajaja hooggantoota isaaniirraa kennameef raawwachiisuuf sa’aatii filannoon itti jalqabamu dursanii halkan achi buluun korojoo guutan, humnoota poolisa federaalaa, humna waraanaa dafee dhaqqabaa fi milishaa bobbaasuun bakka bu’oota boordii filannoo fi taajjabdoota filannoo MEDREK/OFC irraa waraqaa eenyummaa saamuun guutumaan guututti (90%) buufata filannoo irraa ari’aniiru. Dabaltaanis, barattoota manneen baronootaa ol’aanaa kaardii filannoos dhoowwatanii mirga filannoo isaaniis irraa mulqaniiru. (Godina Arsii aanaa Kofalee fi godina Shawaa Dhihaa aanaa Midaa Qanyiitti kaadhimamtootaa fi deeggartoota OFC ajjeesaniiru.) 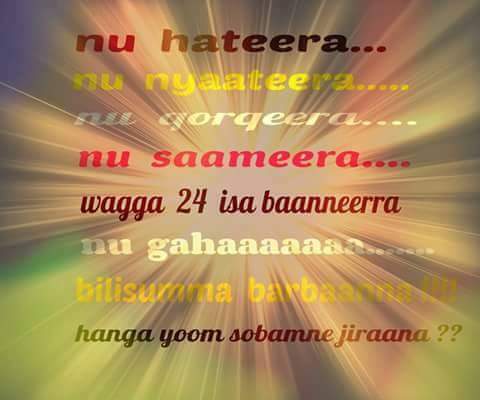 Jimma, Naqamtee fi Baddalleettis hoogganaa ol’aanaa OFC kan ta’an obbo Baqqalaa Garbaa fa reebaniiru. Kanaafuu, mootummaan nama nyaataa wayyaanee sagalee ummataa saamuun tarkaanfii ajjeechaa, hidhaa fi reebichaa hamaa hedduu raawwate. 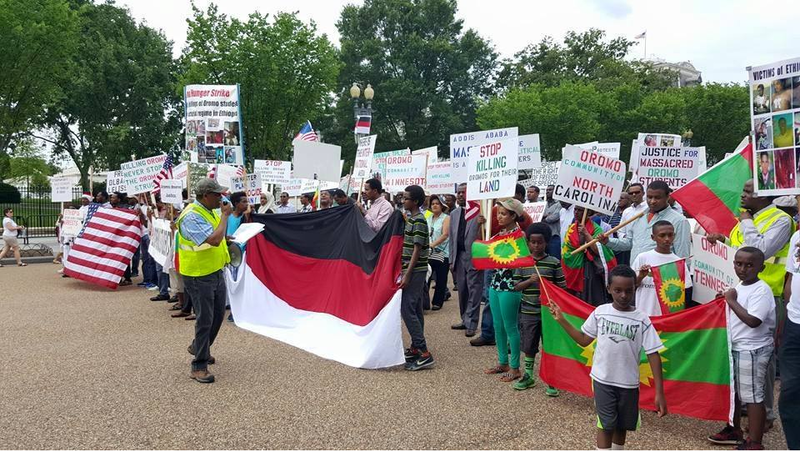 Nuti Gareen Deeggartoota Koongiresii Federaalistii Oromoo Idil Addunyaa gocha waayyaanee kana balaaleffachaa ibsa armaan gadii kana baafneerra. 1. 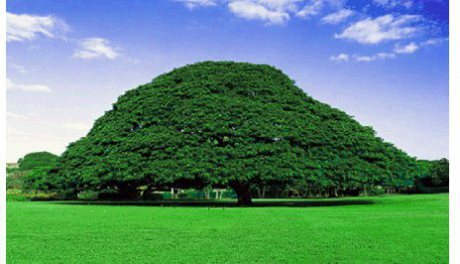 OFC/MEDREK filannoo guutuu Oromiyaa keessatti geggeeffame moo’eera. 3. Saamiinsa sagalee uummataa irraa kan ka’een mormii ka’u hundaaf itti gaafatamaan wayyaaneedha. 4. Mirgoonni heeraan ummataaf kennames humna waraanaatiin irraa mulqamee, bakka buutotnii fi taajjabdootni boordii filannoos ta’ee taajjabdootni mormitootaa buufata filannoorraa ari’amanii filannoon geggeeffame haqa qabeessa akka hin taane ni ibsina. 5. Ummanni keenya Koongiresii Federaalistii Oromoo filachuu fi falmii barbaachisu hundaa godhuu keessaniif isin galateeffachaa kana boodas tarkaanfiin itti aanu maal akka ta’uu qabu KFO irraa hanga kennamutti mirga keessan kabachiisuuf qophiidhaan akka eegdan waamicha isiniif dabarsina. 6. murnootni mootummaa farra ummataa kana aangoorraa kuffisuuf karaa adda addaatiin socha’aa jirtan marti kan beekuu qabdan mootummaan wayyaanee aangoorra kan ture jabina qabaatee osoo hin taane faffaca’iisa humnoota qabsoo Oromoo irraa kan ka’e ta’uu ni hubanna jennee amanna. Kanaafuu, mirgoota ummata keenyaa kabachiisuuf yeroo garaagarummaa xixiqqaa dhiisnee gamtaa fi tokkummaadhaan kaanu amma. WASHINTON,DC—Aanaalee Filannoo Oromiyaa hedduu keessatti humnoonni hidhattootaa Mootummaa akka taajjabdoonni korojoo humnaan harkaa fudhatamee fi irraa hariyatamnitti mallatteessanii fi seera-qabeessa fakkeessan doorsia, hidhaa, miidhaa haga rasaasaan rukkutuu ga’u irratti geggeessaa jiru, ka jedhan – barreessaa Kongiresa Federaalawa Oromoo, Obbo Beqqelee Nagaa ti. Independent team of college students randomly surveyed thousands of voters statewide on Sunday. The exit poll reportedly cross-examined thousands voters from Oromia and all 10 districts of Addis Ababa. All voters surveyed were asked for their party selection, their age and their ethnicity. Mr Connelly said his group organized exit polls in Addis Ababa and Oromia state because of shortage of volunteers in other states. Two volunteers were arrested (then later released) by police in Dire Dawa and Ambo while operating the exit polls, added Mr Connelly. 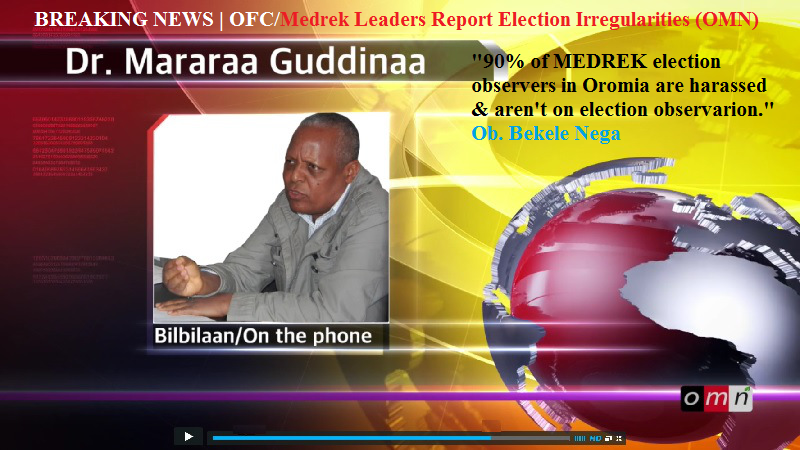 The OFC branch of Medrek and OPDO branch of EPRDF were the most popular parties mentioned by Oromia voters during the exit polls. The EDP, UDJ, AEUO and other small opposition parties collectively received only 21.5% in Oromia, according to the survey. In Addis Ababa city, the unofficial results show the opposition Blue Party won the election with 61.9% while the EDP, UDJ, Medrek and AEUO got a combined 30.6% and the ruling party EPRDF received only 7.5%. The AEUO and EDP parties were more popular among the older age city voters while the city youth overwhelmingly selected the Blue Party. Many Blue Party voters cited previous UDJ (Andinet Party) affiliation. Among those Addis Ababa voters who voted for all the opposition (92.5%); nearly 38% identified themselves as Amhara ethnic groups, 21.5% mixed ethnic group, 17% as Oromo, 14.5% as Gurage and the rest were smaller ethnicities. 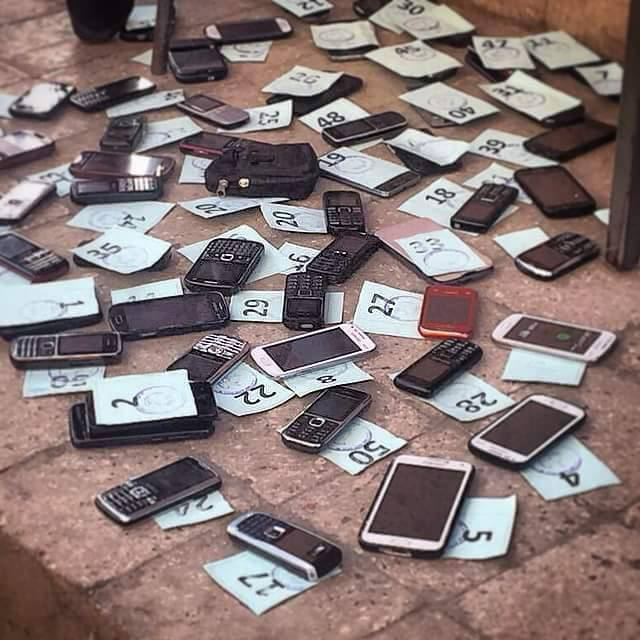 Some voters complained about the ballot box malfunction and many eyewitnessed opposition party election observers being harassed by the police. The majority voters during the exit poll said they have no confidence that their vote will be counted.